15 H.P. / 10 H.P. Flyash, Iron oxide, Lime sludge, Quarry waste etc. KARTHIK ENGINEERING was established in the year 1976, primarily for marketing Pumpsets in Karnataka. Many other engineering products were later on added and the area of operation was extended to all the Southern States. We were instrumental in launching many new products in the market. We have won a number of awards for our achievements in marketing. We are authorized distributors of “Bright” Roller Type Vertical & Horizontal Insect Screen Systems from one of Europe's largest manufacturers, Bright S.A. Athens, Greece. 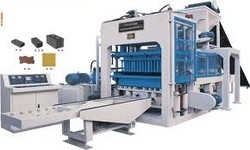 We are also the authorized distributor for “LITTLE BLOCK” Block Making Machinery & other Construction Machinery manufactured by Engineers Enterprises, Coimbatore, a pioneer in this field. Karthik Industries is our sister concern that was started to manufacture "KARTHIK" Construction Machinery and "KARTHIK" Powder Coated Aluminium Frames for Windows & Doors with Mosquito Mesh from "PHIFER" incorporated U.S.A. “KARTHIK” the Sleek Type Mosquito Mesh System & “Bright” the Roller Type Mosquito Mesh System are custom made for windows & doors at our state-of-the-art unit. We market & manufacture only high quality products. We are reputed for our quality standards and our after sales service. KARTHIK ENGINEERING & KARTHIK INDUSTRIES are reputed for marketing and manufacturing only high quality products. We have set for ourselves high standards and we always strive to keep up to it. Our distinguished customers are extremely happy with our products and our after sales service. The goodwill we have earned through the years has gifted us a long list of distinguished customers, which is steadily growing. We are looking queries from South India.